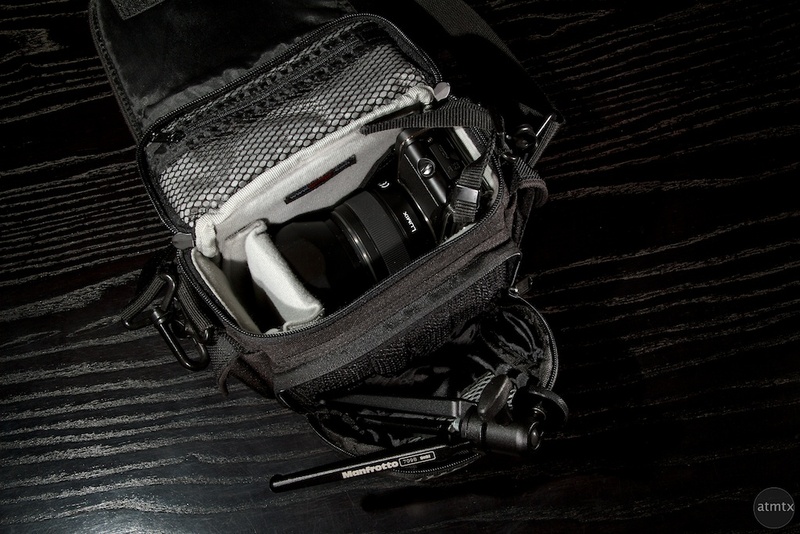 One of the more popular posts, despite the hundreds of others, is the one I did on a small camera bag for my Sony NEX-5. I may not use my NEX often these days but I still use this bag frequently. 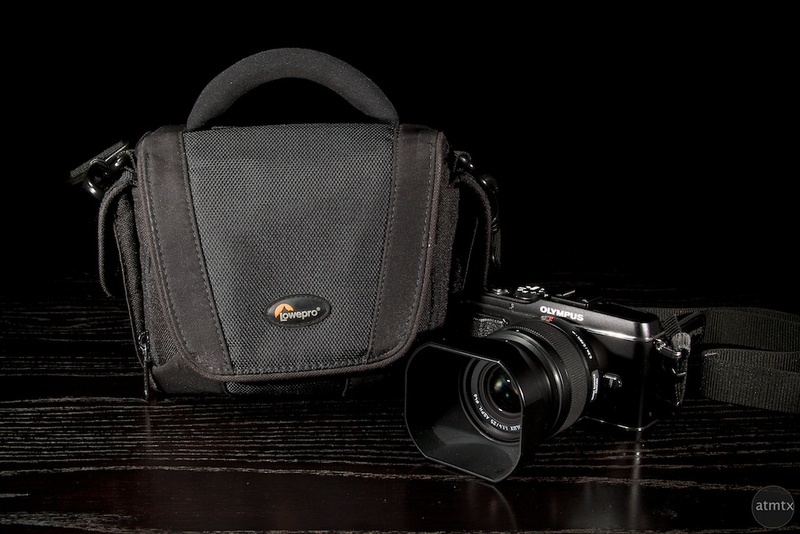 It’s perfect for carrying a smaller mirrorless camera such as the Olympus E-P3 or E-PM2. Luckily the LowePro Edit 120 is inexpensive too, usually running around $25. The bag has one moveable divider. I usually put the camera with attached lens on one side and possibly a small lens in the other (depending on the size of the attached lens). For larger lenses like the Panasonic 45-200mm zoom, I remove the divider. There is a mesh pocket on the inside of the cover and the front zippered pocket works well for accessories. It even fits my favorite table top Manfrotto tripod, which is surprisingly handy. The front area also works well for extra batteries and SD cards. Finally there are velcro covered pockets that flank the bag. In the photo below, I have the Olympus E-P3 with the Panasonic Leica 25mm f1.4 plus lens hood. The 25mm is one of my bigger lenses when I have the lens hood attached. It’s about the same length as the Olympus 40-150mm zoom. The left over space snuggly fits the small Olympus FL-300R Flash. If you can’t find this bag, look for small camcorder/video bags. These type of bags are less deep and work well for mirrorless cameras. Typical camera bags are scaled more for DSLRs which are too deep. With DSLR bags, you end up with a bulkier bag than you need and small mirrorless cameras get lost at the bottom. This bag is a perfect solution for a carry bag for my SX30IS digital camera. Enough room for camera, strap, hood. I really like the velcro closure option. Great price makes this a high value purchase. Seems well made and I like the design. pecom1982, thanks for the feedback. Good to know. It is a versatile little bag.